Popular Electronic's General Electric 1VHD3042W Video High Density Disc Player Test. The Matsushita/JVC Video High Density (VHD) disc player is now off the drawing board and into hardware. Initial prototypes have been delivered to U.S. partner General Electric and Matsushita-owned Panasonic. The disc itself is smooth-surfaced, 10.2" in diameter. It is made from com-pression-molded PVC plastic, carbon black, a lubricant, and other additives. Spinning at a constant 900 rpm, it is designed to play one hour per side. 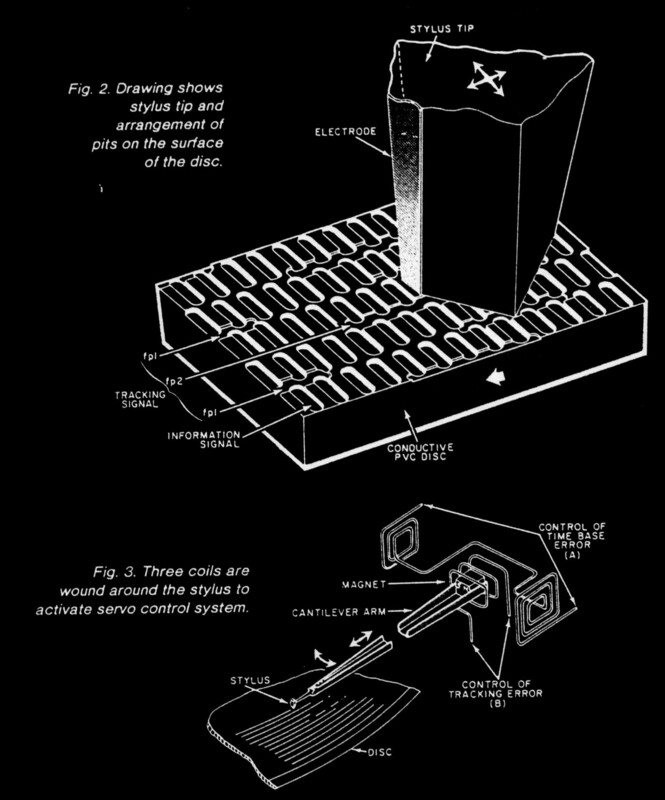 Be-cause the force of the stylus on the disc is spread over more disc area than in the CED (Capacitance Electronic Disc) sys-tem, pressure on the surface is accord-ingly less. Stylus life, consequently, could amount to more than 1,000 hours, and recordings last for up to 10,000 plays. Dual audio channels can carry either full stereo or bilingual outputs. Time-share picture and audio frames (54,000 per disc) are molded into the plastic as variable length pits of uniform depth, with tracking pits running along-side, and at right angles to them. The pickup head has only flat contact with the record, and may move freely over the disc's surface, permitting still pictures and forward and reverse slow mo-tion at 1/2, 1/4, 1/8, and 1/16 normal speed. Similarly, forward and reverse fast pic-ture search (with picture) is possible at 2, 3, 4, and 5 times normal speed in the forward mode, and 2 and 3 times normal in reverse. There is chapter and time access, but no frame identification. This will come later-at added expense. Meanwhile, the reduced method of picture identifi-cation will locate any specific image within about 15 frames, and frame-by-frame motion control can quickly move the stylus arm into the exact position for the frame desired. The disc player will be introduced in Japan in October of this year, in the U.S. in January of 1982, and in Britain six months after that. Here, the system is to be marketed under the General Electric, JVC, Panasonic, Sharp and Quasar brand names. Meanwhile, nego-tiations for first-run movies, various shows, and other entertainment and educational programs are in progress. diagram (Figure 1) of the overall player was made available by General Electric. But even that is a good deal more than had been released previously. The equipment is designed to operate in sequential steps, with lighted green indicators suggesting each succeeding step. The stylus is always in contact with the recording until play is completed, af-ter which the player automatically moves to the unload position, and the time clock resets to zero. Variations in capacitance (equating to frequencies from 6.1 to 7.8 MHz) are picked up from individual pits on the disc by an electrode attached to the sty-lus and in physical contact with the disc (Fig. 2). A 915-MHz oscillator provides a carrier for the signal, which is then peak-detected so that it contains the to-tal video and audio information. A head amplifier receives this information and passes it to the tracking servo circuit, the dropout compensation (DOC) detec-tor, and the video detector. 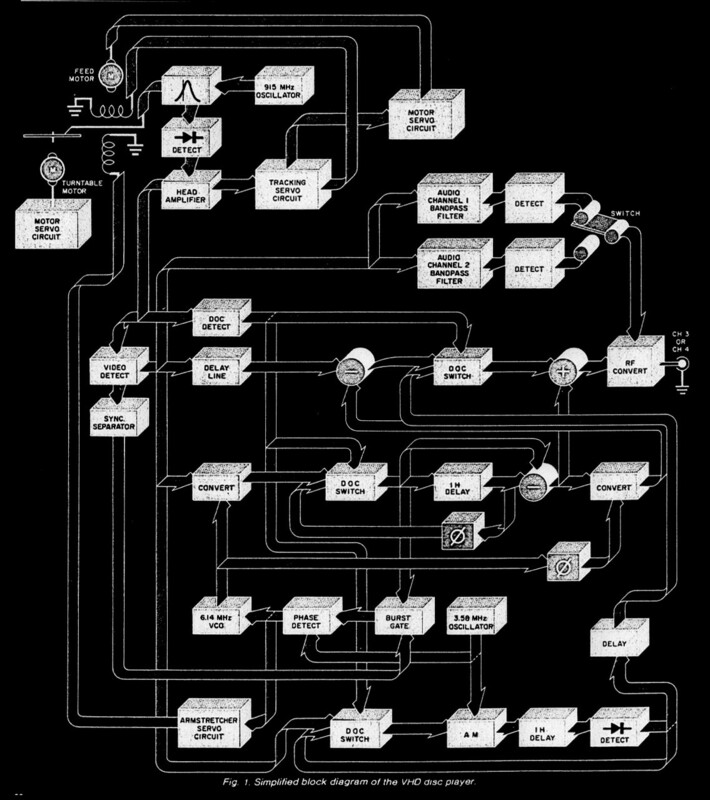 Additional signal paths lead from the tracking servo circuit to the motor servo circuit, and to the stylus coils on either side of the input. Three coils guide the stylus (Fig. 3). controlled oscillator. It is then passed to the dropout compensator switch, which is also supplied with feedback from the I H (horizontal line) delay line. Should a dropout occur in a line of video informa-tion, the previous line is automatically substituted. I H delay line and its 1 H detector. This is part of a coincidence switching ar-rangement that permits the main DOC switch in the luminance processor to be activated just prior to final chroma addi-tion at the r-f converter. The armstretcher servo circuit also bears mention. Its sensing signal is de-rived from the 3.58-MHz oscillator's phase detector, and from the incoming chroma burst gate. A phase-locked loop corrects both the frequency of the 6.14-MHz voltage controlled oscillator and the positioning of the stylus. Analysis. G.E. 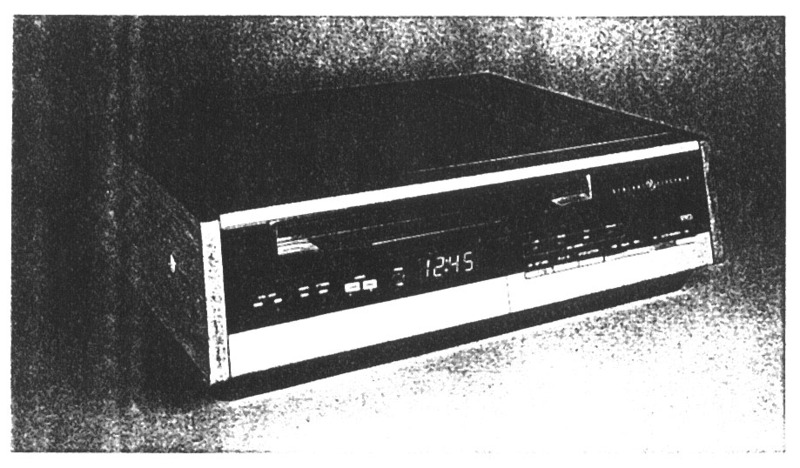 's and Matsushita's product falls somewhere between RCA's Capacitance Electronic Disc (CED) and the Philips/Magnavox/Pio-neer laser disc player. If recorded at only 1/2 hour per side, stop field/frame performance would theoretically be comparable to that of the laser unit. However, since each side is recorded for a full hour's play, any frozen picture occupies four fields or two frames. Where relatively still scenes are dis-played, there's very little movement visi-ble in the freeze frame. but where there is rapid motion in the picture, the jitter is rather pronounced. Otherwise, this versatile player does essentially everything that the l/2~hour. per-side laser disc can do, with very little stylus and disc wear. Signal-to-noise ratios are much the same for Magnavox, RCA, and G.E./Matsushita at modula-tor outputs. There are, however, base-band ports for both audio and video in the G.E./Matsushita equipment that can reduce apparent noise through a more direct signal path. Stereo sound and bilingual channel reproduction are excellent, while picture quality probably comes very close to the 3.1-MHz design standard. Color rendition is exceptional for a player of this type.